I love horror movies. 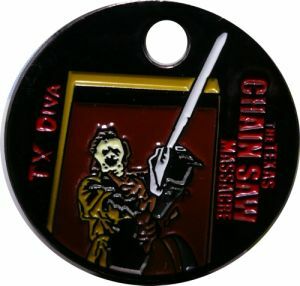 I have always loved Texas Chainsaw Massacre. That one scene in the original movie when Leatherface slams the metal door shut still spooks me. Even though the movie truly stems from the story of Ed Gein, the first two movies were filmed at locations in Texas that I have either seen or can find easily. At various horror conventions I've met 3 out of 4 of the original Leatherfaces, and many of the other actors. Many thanks to Gonzalo Arenas (Alamos Trail) for his awesomely gruesome design. 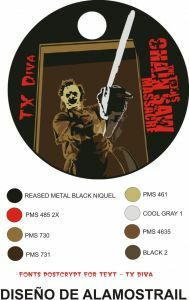 He originally designed two Leatherface tags for Dark Star, who chose the other design. I'm pleased, because I love this one! I now have these in hand, and they look great!